Protect your RV’s interior from rain damage while allowing your roof vent to remain open. 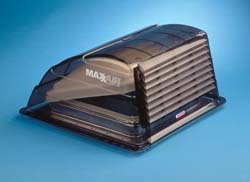 Allows constant air flow through your RV to stop heat buildup. Musty air, heat, smoke, and cooking odors escape while rain stays out. Features MaxxAir’s exclusive Zero-Leak™ Mounting System that eliminates the need to drill any holes in your RV’s roof surface. Mounts to most popular 14" x 14" standard roof vents. Six-year limited warrenty. 1/box. Priced each. steel or aluminum for durability and long life.